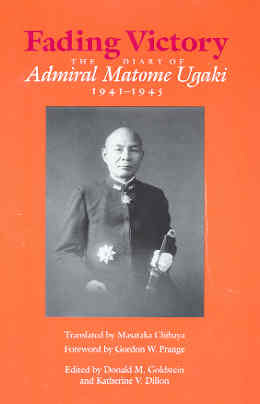 Vice Admiral Matome Ugaki held several key leadership positions during World War II. These included chief of staff for Admiral Yamamoto, commander of the 1st Battleship Division that included the giant battleships Yamato and Musashi, and commanding officer of the 5th Air Fleet as he directed kamikaze attacks against Allied ships off Okinawa. This exceptional English translation of his diary written from October 1941 to August 1945 provides an invaluable primary source of the Imperial Japanese Navy's wartime strategy and battle tactics. Masataka Chihaya, a former officer in the Imperial Japanese Navy and a postwar journalist, translated Ugaki's diary to English. Members of Ugaki's family preserved the diary after the war, and now the Etajima Museum of Naval History prominently displays 13 of the original 15 volumes written by Ugaki in a room dedicated to the Kamikaze Special Attack Forces. The volume covering the first three months of 1943 was lost after the war when Ugaki's senior staff officer borrowed it from the family and was taking it with him on a train to appear as a witness to the military tribunal in Tokyo (pp. 222-3). The other missing time period is between April 25, 1943, and February 22, 1944, when Ugaki was convalescing after American planes shot down his plane over Bougainville Island. His son Hiromitsu refused to release the diary entries for this period, claiming they were solely personal and not of historical interest (pp. 223, 331). Donald Goldstein and Katherine Dillon, editors of Chihaya's English translation of Ugaki's diary, make several valuable contributions. They provide bracketed italicized comments throughout the diary to provide historical context for some of Ugaki's comments. For example, Ugaki often overestimates the extent of damage inflicted on the enemy based on his men's optimistic reports at the time, but the editors' comments provide damage reports primarily from books by two eminent World War II historians, Samuel Eliot Morison and Gordon W. Prange. The editors also condense parts of the diary that discuss routine events, and they provide summaries of the deleted parts that do not contain anything of historical importance. This well-documented book also includes a selected bibliography, complete endnotes with sources, list of abbreviations, index, Ugaki's career brief, and list of names cited in the text. It's true that I don't know any cardinal state secrets, now that I'm serving at sea far from the center of government, but I'm sure it will be necessary to record frankly in my diary about matters of official business that won't appear on official records, my opinions, my impressions, my speeches and actions, and my private matters, without regard to distinction, as they come into my mind day by day. This will be of some use to someone else in the future, because of my past guilt in bringing events to the state they're in today, and because of my present post as chief of staff of the Combined Fleet that carries the burden of the welfare of the state. Accordingly, it will be appropriate to give this diary the name "Wastebasket of War" or, rather, "Seaweeds of War." Saturday, 13 May 1944. Partly fair. We crossed toward the Shinnan islands and the north of Borneo. At 1830 we entered Balabac Channel. We sailed in a long line of columns. On the first day, two reconnaissance seaplanes cooperated with us in guarding from Singapore. Yesterday we didn't dispatch any of our own aircraft. Apart from the extent to which it could help us, I was pleased to see they have come to cooperate with us at sea. After passing through the Balabac main channel, we took the northerly course, avoiding shoals. Fleet training wasn't executed today. The sensitivity of enemy submarines' telephones has become stronger after entering the Sulu Sea. 1. Ugaki's Battle Actions and Results - Most diary entries focus on details of battles and operations that Ugaki personally led. For example, he directed Japan's air attacks during the Battle of Okinawa as commander of the Navy's Fifth Air Fleet headquartered at Kanoya Air Base in Kyushu, the southernmost main island of Japan. During April and May 1945, the Sixth Air Army also was placed under his command by order of the Combined Fleet. From April 6 to June 22, 1945, Ugaki ordered ten separate mass aerial attacks (named Kikusui, meaning "Floating Chrysanthemum"), which included numerous kamikaze planes. 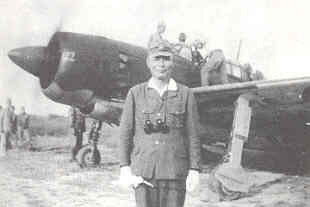 During the Kikusui attacks, he provides in his diary many invaluable historical details of searches for enemy ships, planes used and lost in attacks, and estimated enemy damage. He refers in a few places to lack of fuel, planes, and experienced pilots to carry out effective attacks. 2. Navy's Battle Actions and Results - Ugaki's accounts of major Pacific battles such as Midway, Guadalcanal, Leyte Gulf, and Okinawa provide valuable insights into the thinking of Japan's military leaders. As Admiral Yamamoto's chief of staff, Ugaki regularly provided analysis of naval battles and participated in strategy sessions. The diary often provides Ugaki's opinions of specific causes for Japanese battle losses, but he rarely speculates in his diary about the future. He frequently expresses dissatisfaction and doubts regarding the Combined Fleet's strategy of trying to engage the Allies in a decisive naval battle, and he recommends that the Japanese military adopt the strategy of trying to gradually reduce enemy strength by engaging them locally at opportune moments. 3. Personal Life - Although his wife Tomoko passed away in 1940, he remembers her fondly, especially on each anniversary of her death. On April 26, 1944, Ugaki writes (p. 364), "Today is the day on which four years ago the death of Tomoko, my wife, took place. Early in the morning I prayed for her happiness and told her spirit of my determination. It's my firm belief that I owe her soul a great deal for my being able to do my duty today like this." Ugaki also writes as a proud father about his son Hiromitsu, who was appointed as a naval medical officer in January 1945. Some diary entries briefly mention Ugaki's pastimes, mainly hunting and poetry writing. Many poems he wrote in his original diary have not been included in this English translation, but a translated poem about special attack forces poignantly expresses Ugaki's feelings toward the young men who died in suicide attacks. A few comments mention his personal health, including continuing problems with his teeth that sometimes cause him great pain. Just one week prior to the end of the war, he visits the hospital to get a crown for a tooth. 4. Personal Reflections - The diary contains no lengthy passages of personal contemplation but rather short statements sprinkled here and there that collectively allow the reader to understand something of Ugaki's personality and individual beliefs. Ugaki's diary has scattered references to his personal views on fighting and dying with honor. In March 1944, he writes (p. 338), "Human life is precious, yet we must not avoid sacrifices to win the war." On the four-year anniversary of the death of his wife Tomoko, he writes (p. 365), "To fight so gallantly that one's name goes down in history, and commit hara kiri [ritual suicide] when nothing is left to one will be best, I think." Even early in the war in 1942, he praises the courage of an American submarine crew who boldly attacked the battleship Yamato in the midst of threatening depth charges. He writes (p. 197), "I wish our submarines had the same courage and more determination to destroy the enemy, even at the sacrifice of themselves." Even though it becomes impossible for us to continue organized resistance after expending our strength, we must continue guerrilla warfare under the emperor and never give up the war. When this resolution is brought home, we can't be defeated. Instead, we can make the enemy finally give up the war after making it taste the bitterness of a prolonged conflict. The diary contains virtually no joking or sarcasm, but he does make an entry that approaches black humor when he hears of the death of President Roosevelt. He writes (p. 584), "We should send a cable of condolence for the death of Roosevelt promptly!" He explains that Japan's aerial attacks on the American fleet around Okinawa killed him, but of course these had no connection with his death. Although Vice Admiral Ugaki commanded kamikaze attacks against American ships off Okinawa, his diary contains very few comments specifically on suicide attacks in comparison to conventional attacks. He gives his reaction to kamikaze attacks when he hears of their first use in the Philippines in October 1944 (p. 503), "I'm glad to see that, as the situation becomes critical, this kind of attack method comes to the fore without compulsion, thus displaying the glorious way of warriors." However, based on several comments he makes in the diary about fighting and dying with honor, it comes as no surprise that he commanded the Fifth Air Fleet's kamikaze attacks without question from February to August 1945. It is predictable that when faced with defeat he decides to die honorably while "displaying the real spirit of a Japanese warrior" (p. 666). When Ugaki heard that Japan planned to accept surrender terms, he decided to lead a final kamikaze squadron to ram enemy ships at Okinawa. He wrote (p. 664), "I'm going to follow in the footsteps of those many loyal officers and men who devoted themselves to the country, and I want to live in the noble spirit of the special attack." Since he was not a pilot, a volunteer sat in front of him in the back seat as their two-seat Suisei dive bomber took off with ten other planes. Apparently they crashed into the sea without reaching any American ships. Even though Ugaki concluded his writing with the following words, "this diary must never be placed in enemy hands," this outstanding translation today provides invaluable historical perspective regarding the Pacific War to English speakers on the Allied side. However, readers without a basic understanding of the major battles will find Ugaki's diary extremely difficult to read even with the helpful explanatory notes provided by the editors.